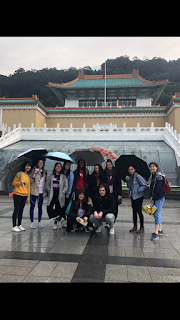 大家好！Over the winter break in Taiwan I made dumplings with my class, ate at the famous Din Tai Fung restaurant, visited the Ximen and Shilin night markets, and went to the National Palace Museum. It was so much fun visiting these places but a challenge to keep up with my homework while doing so. Most of our extra-curricular events for this study abroad are these trips so there really was no opportunity to join any clubs within the school (also since this was a short-term abroad). For this blog I want to focus on the differences between classroom communications in Taiwan and the United States. One very interesting aspect of taking a class here in Taiwan has been the out of class communications with the teacher as well as with other students. In the US, most teachers are available only through email and sometimes office hours. However, if they need to send out a class wide message, they will usually make an announcement in our online class forum, ELMS. However, there is no ELMS in Taiwan as most people use the app, Line, to communicate. When I first arrived in Taiwan, our student counselor asked us all to get the app and I assumed it was similar to what I use in the United States called GroupMe, which is an app that most young people use to communicate for group projects, friend groups, etc. My use for Line continued as when I started our classes; our teacher asked me for my Line username and code so I could be added to the classroom group chat. Since then, all of our classroom communications are on this app including if we have a test, what the homework is, if anyone has a question on something from class. I found this very interesting since Line to me seemed like a social media tool at first but now has almost become part of the “required materials” list for our class. The obvious advantages of using this app to communicate with our class is that it is very convenient. Whenever anyone asks a question in the group, the teacher replies very quickly because she is getting a notification on her personal phone. Beyond this, since communication on Line is less formal than emails for example, the teacher uses emojis and stickers for her reactions to messages. She is also able to ask the group, where is a certain student is she/he is running late and get a very quick response. This all would most likely not happen in the US. However, the main disadvantage is that her work does not seem separate from her personal life as I have seen her using her personal phone to message us. I know I would not want to be receiving questions from students on my personal cell phone, which is why I think many professors in the US always tell students to email their school email address. Another disadvantage though of using Line instead of an online classroom platform like ELMS is that ELMS is able to show students their grades and has many other helpful features. We have been in class for a little over two weeks but I never witnessed anyone talk or check any online portal to see a listing of their grades. In this same way, our class would have to wait for our teacher to return our tests and quizzes in order to see our grade. I really appreciate the different features of ELMS for these reasons but am grateful to have been in this class to see the different dynamic outside communication in a group chat adds to the classroom in Taiwan. Below is a picture of our group photo on our last excursion to the National Palace Museum.